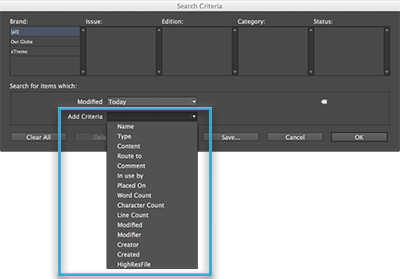 Users of Smart Connection for InDesign/InCopy and of Content Station can create a Custom Search with which they can store a set of search criteria for performing repetitive searches. It works by defining the search criteria once, saving them as a Custom Search and then accessing that Custom Search whenever it is needed. Defining the search criteria is done by choosing them from a list of options. Figure: Criteria that can be added to a Custom Search are available in the Add Criteria list of the Custom Search dialog box, as seen here in Smart Connection. By default, only a few criteria options are listed such as name, type, and comment. Changing the list is done by setting up the Query parameters in Enterprise Server. The steps to follow depend on the version of Enterprise Server that is used. Step 1. 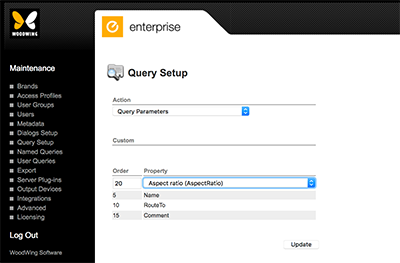 Access the Query Setup page. In Enterprise Server, choose Query Setup in the Maintenance menu on the left side of the screen or on the Home page. Step 2. From the Action list, choose Query Parameters. When adding a first setup for the chosen query, a message appears stating that in the setup that you are about to create, mandatory properties such as Name, ID or Type will be automatically added. You will also be asked if regularly properties such as 'RouteTo' and 'Comment' also need to be added. Step 4. (Optional) Click Yes or No. In the Order box, enter a number that specifies the order in which the property should appear in the list. Note: The higher the number, the lower the property will appear in the list. Choose a property from the list. Step 2. Leave the option <All> selected for the lists 'Brand' and 'Object Type'. Step 3. 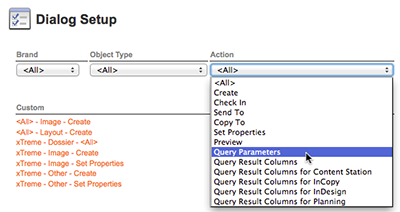 From the Action list, choose Query Parameters. The title of the page changes to 'Query Setup'. Step 4. Click Add Action Property. Fields for adding a property appear. Step 5. (Optional) In the Order box, define the order in which the property should appear by entering a numeric value. Step 6. 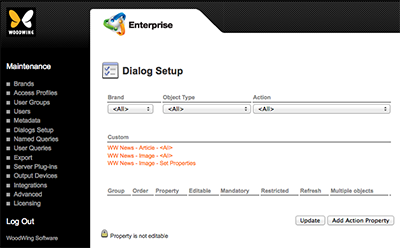 From the Property list, choose the property that you want to add to the dialog box. Note: The properties that are added here will fully replace the default list, meaning that if you only add one property, the Add Criteria list in Smart Connection and Content Station will only contain that one property. To restore the list to the default values, remove all properties that were added to the list of Query Parameters. 13 March 2019: Added information about the process in Enterprise Server 10.5 and higher.